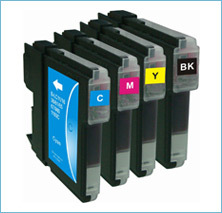 Why Choose Remanufactured or Compatible Ink Cartridges? There are many reasons why you should try our remanufactured and compatible ink cartridges here at Printer Ink cartridges. First of all, our remanufactured and compatible ink cartridges are a lot cheaper than their counterpart original ink cartridges and that helps save money with printing with your inkjet printer in the home or in the office. In addition to this, all our remanufactured and compatible ink cartridges are made to the highest possible standard and so consistently print great looking results from your inkjet printer. Here at Printer Ink cartridges we stock only the highest quality compatible ink and toner cartridges and endeavour to ensure that every compatible ink and toner cartridge that we supply will provide our customers with the very best printing results that we can give. Our remanufactured and compatible inkjet cartridges and laser toner are the perfect choice for your everyday printing needs due to the vivid colour reproduction, whether for printing documents or photographs. All our ink cartridges help you produce your printing at a fraction of the cost of the original ink cartridges. All our compatible inkjet cartridges and laser toner cartridges are individually tested at Printer Ink Cartridges. We source all our compatible ink cartridges from the best tried and tested ink cartridge remanufacturers in Europe, giving our customers the reliability and peace of min they need. In addition to this we supply our compatible ink cartridges to you at highly competitive prices ensuring you get the best prices, especially on our multipacks deals and bundle pack ink cartridge deals. We sell compatible inkjet cartridges and remanufactured inkjet cartridges at Printer Ink Cartridges giving consistency and reliability to our customers. The highest quality pigment inks are used in the remanufacturing process of our ink cartridges, in fact, in all our ink and toner cartridges. We have invested heavily in the latest remanufacturing technology in our factories and ensure all the inkjet cartridges and laser toner cartridges are fully tested before they leave the factory. Printer Ink Cartridges specialise in the remanufacturing of compatible ink cartridges and have spent recent years perfecting the techniques of providing our customers with what we believe to be the highest quality compatible ink cartridges sold on the web. Spot checks are carried out on compatible ink cartridges to ensure that when you get your compatible ink cartridge that it will work perfectly. Whilst we sell the cheapest ink cartridges in Ireland, and indeed, we believe, the cheapest ink and toner in Ireland, we will not compromise on quality and customer satisfaction. That’s why we give a 100% money back guarantee on all our cartridges.